Jackson is a manufacturer of electric guitars and bass guitars that bears the name of its founder, Grover Jackson. Grover Jackson obtained ownership in Charvel's Guitar Repair of Glendora, California in the 1970s with a promise to bolster Charvel's business. Wayne Charvel eventually sold his interest to Grover Jackson on November 10, 1978, which gave Jackson control of the business and the Charvel brand. Jackson Guitars originated in 1980 when guitarist Randy Rhoads approached Charvel with an idea for an individualized guitar. The collaborative design effort between Rhoads, Grover Jackson, Tim Wilson, and Mike Shannon resulted in the creation of the Concorde, an innovative revamp of the traditional Flying V. The Rhoads guitar model designs were such a departure from Charvel's Stratocaster-based models that Jackson elected to label them with his own name. The 1990s brought changes in musical trends, and brands like Jackson began producing inexpensive, Asian-made versions of their staple designs in an effort to make their products more attractive and accessible to lower-end buyers. In the Fall of 2002, Fender Musical Instrument Corporation purchased Jackson, and U.S. operations were moved to the Fender factory in Corona, CA. Present day Fender era Jacksons (and Charvels) are being produced at the Corona works. After several years of running a successful company doing sub-contracting work for many well known guitar companies and extensive design consultancy, Grover Jackson is now co-owner of a new guitar brand, GJ2 Guitars, in Orange County, California. His partner in this venture is former Fender Senior Vice President Jon Gold. Grover Jackson maintains his commitment to high quality USA made guitars. 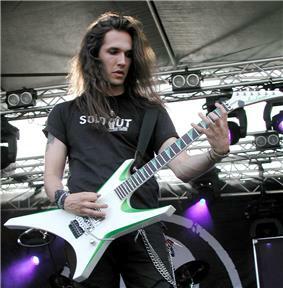 Ben Varon playing a Jackson, 2009. From the earliest beginnings until the present day, Jackson Guitars is known for its slender, elegant designs, and feature aggressive motifs that are popular with hard rock and metal musicians. Traditionally, Jackson (and many Charvel) guitars share the typical pointed headstock that first appeared on the Rhoads prototype in 1980. This likely arose from trade dress infringement issues as a result of Charvel's use of Fender Stratocaster shaped headstocks until the early 1980s. Fender's 2002 acquisition of both the Jackson and Charvel brands has enabled the Strat-style headstock to be reintroduced (under license). Another Jackson trademark is the 'shark fin' inlays, which inspired other famous guitar companies such as Ibanez to follow suit with similar designs. In 2004, Jackson released the DK2 guitar series featuring a Sustainiac® Driver/Pickup in the neck position of the guitar. Dinky: A bolt-on superstrat with a body 7/8 the size of a Stratocaster. 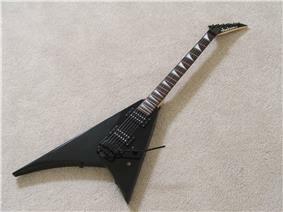 Kelly: A sleeker version of Gibson's popular Explorer, made famous by Marty Friedman of Megadeth, who had a signature model made for him, the KE1. King V: A symmetric 'V' shape with long pointy wings, Based on the Double Rhoads model originally designed for Robbin Crosby of Ratt, but popularized, through prolific use, by Dave Mustaine of Megadeth, who had a signature model, the KV1. Rhoads: An asymmetric 'V' shaped body with pointy "wings", designed for guitarist Randy Rhoads. Soloist: A neck-through body superstrat with a body 7/8 the size of a stratocaster. Warrior: An aggressive body style consisting of four pointy ends that mimic the Jackson headstock shape. Phil Collen's PC1 Signature Dinky: Dinky style with a Jackson Sustainer/Driver pickup in the neck position, DiMarzio HS2 Stacked Humbucking Pickup in the middle position, DiMarzio Super 3 Humbucking Pickup in the bridge position, Floyd Rose original locking tremolo and gold-plated hardware. It was followed by the short lived, Guitar Center only designated PC2, which only came in Amber, Natural, and Red Trans finishes, with "Custom Shop" on the headstock instead of Collen's signature, and the mass marketed PC3, which had Collens' signature on the headstock like the PC1. Both were a moderately priced version featuring Duncan Designed pickups and no sustainer. The PC2 was fitted with a Wilkinson floating bridge, where as the early PC3 came with a Wilkinson, then later fitted with a licensed, brushed finished Floyd Rose. Chris Broderick's Signature Soloist: Based on the soloist but with a custom asymmetric arch-top design. It features stainless steel frets as well as custom DiMarzio pickups, a low-profile Floyd Rose tremolo, push-pull potentiometers, and a kill switch along with other unique features. Available in both 6 and 7 string varieties. Phil Demmel's Demmelition V: A signature guitar based on the King V with cutouts on the bottom of both wings. Adrian Smith's San Dimas: A signature guitar based on the 1980s Jackson custom shop models produced for Iron Maiden's Adrian Smith. Scott Ian's T-1000: A signature guitar for Scott Ian, based on his original Soloist but with a slightly bigger body. Death Kelly: Similar to the Kelly; the bottom portion of the guitar is cut almost like the Warrior, but the upper portion near the neck remains the same. Death Angel: Similar to the Death Kelly; the bottom portion of the guitar is cut almost like the Warrior, but the upper portion near the neck has a SG/Kelly type shape. Demon: Shaped almost exactly like an Ibanez 540. Double Rhoads: Originally designed for Robin Crosby of Ratt. This is the same basic shape as the King V model, but the body is approximately 3 inches longer at the end. Crosby was approximately 6 foot 6, so the King V was created as an option for people closer to average height. PC Archtop: Jackson's first Signature Model for Phil Collen, developed in 1988 after using various Soloist & Dinky custom models for 2 years. Phil and Grover Jackson decided to make an ergonomically correct guitar with a body like a normal arched-top Super Strat, except the top horn is dramatically bigger, the lower horn has more of a Fender Telecaster shape, and was concaved much like a Spector NS-series Bass Guitar. Roswell Rhoads: General concept of a Rhoads (asymmetric 'V'), except it's more curved, like an asymmetrical 'U'. Star: Exactly like the original Charvel Star, except with Jackson headstock and label. Surfcaster: Exactly like the original Charvel Surfcaster except with different logo. Xtreme Rhoads: Rhoads with slightly scaled down body and shorter top fin. Kelly Star: Similar to the Kelly; the bottom portion of the guitar cut almost like the Rhoads, but the upper portion near the neck remained the same. Y2KV: Used by guitarist Dave Mustaine; a custom V with rounded edges, first launched in 2000 and offered until 2002. Strat: A full-sized Fender Stratocaster body with bolt-on neck. Replaced by the Dinky, which has a more streamlined 7/8 strat body, in the mid 80's. Typically having 22 frets. Swee-tone: Double cut-away, superstrat style body shape somewhat resembles to Soloist AT. Non-pointy headstock with 3 by 3 tuner layout, 22 frets and 25 inch scale length, mahogany neck-through and spruce body wing construction, 2 humbuckers, 3 knobs and a blade switch. Mark Morton played it for a brief time around 2005, then he developed his Dominion signature model around this one. "Professional" is a tag that denotes the Japanese-made versions of many popular USA models. All Jacksons with "Professional" on the headstock are made in Japan. "Performer" is a tag that denotes Jackson's low end models, produced during the mid-1990s in Asian factories (initially Japan, later Korea and eventually again in Japan). "Concept": One of the rarest production series of Jackson imports ever built was the "Concept" models. They were made for only a few months, beginning at the end of 1993, before quality issues forced Jackson to end it's contract with the factory that were making them. The Concept Series was replaced with the Performer Series. ^ "Dealers". Jacksonguitars.com. Retrieved 2012-10-20. ^ "Randy Rhoads: Flight of the Concordes". Guitar World. Retrieved 2012-10-20. ^ "Jackson DK2 Sustainer Review". Guitarhoo!. Guitarhoo.com. July 1, 2004. Retrieved April 16, 2014.